As I’ve mentioned, I took the time to watch Produce 101 Season 2 (a year late) in part to catch glimpses of Jeong Sewoon and the Nu’est members, but also to get to know this up and coming group of idols poised to take over the scene in the next year. It worked,.I learned many of them quite well and became at least familiar with a boatload more. They are now starting to pop up all over the place and despite nearly reaching full saturation for groups to love, I can’t help but to pay attention and get attached. Better Judgement be damned. One of the trainees that I found particularly endearing was Takada Kenta, a Japanese hopeful that had been with his agency for just over a year before the show started. You could see him kind of grow into himself as the show progressed and with that newfound confidence came charisma and an increased skill set. Of course, I knew that Kenta ended up as part of JBJ, the fan-made group from the show, but project groups make me a little nervous because we go into it knowing there will be an end. As a trainee and then a debuted idol without a group, that situation has to feel really scary. You now have all of this experience and some pretty crazy expectations on you to succeed, but you don’t necessarily have the infrastructure in place to make it happen. Just look at Sanggyu, the former member of Topp Dogg and Produce alum. He’s debuted and has some decent street cred, but it was made quite clear that he no longer had a group to return to after Produce was done and then after his months with JBJ. Thankfully for us, a power duo was born. 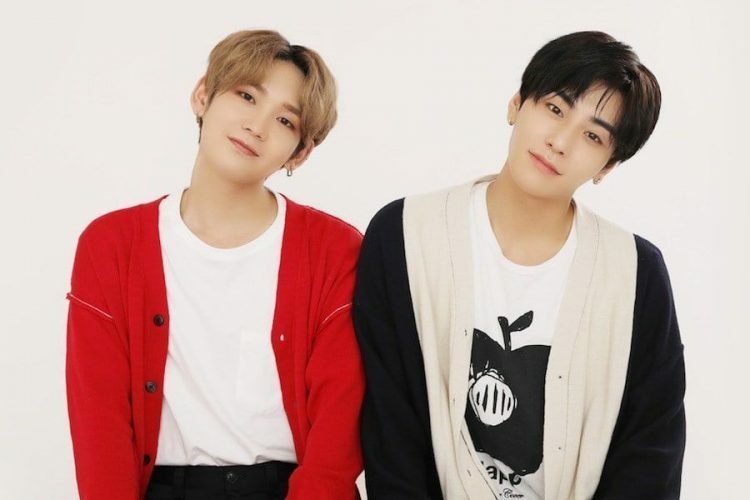 Their respective agencies have seemed to have figured out this mysterious and magical way to work together in order to have their idols continue to perform as a permanent group, bring on JBJ95. They opted to keep the JBJ as it was a name the group had worked so hard to come up with and they didn’t want to lose the memory of how they had come together. The 95 is, of course, their shared birth year. What’s really fun for them is that Kenta, a subvocal in JBJ, is now a main vocal and has a chance to really shine while Sunggyu, a rapper, is learning what it takes to do a heck of a lot more vocal work. What a great learning experience for them, and a treat for us as the listeners. Their entire debut album is fantastic, there wasn’t a song that turned me off. Home, the title track, is a solid dance/pop number and the video is all washed out and gorgeous. So now I’m sucked in and invested. It helps that there are only two members and I already know them pretty well as that means a lot less time spent laboring over learning names and personalities and a lot more energy spent on just listening to the music and feeling pleased for them.